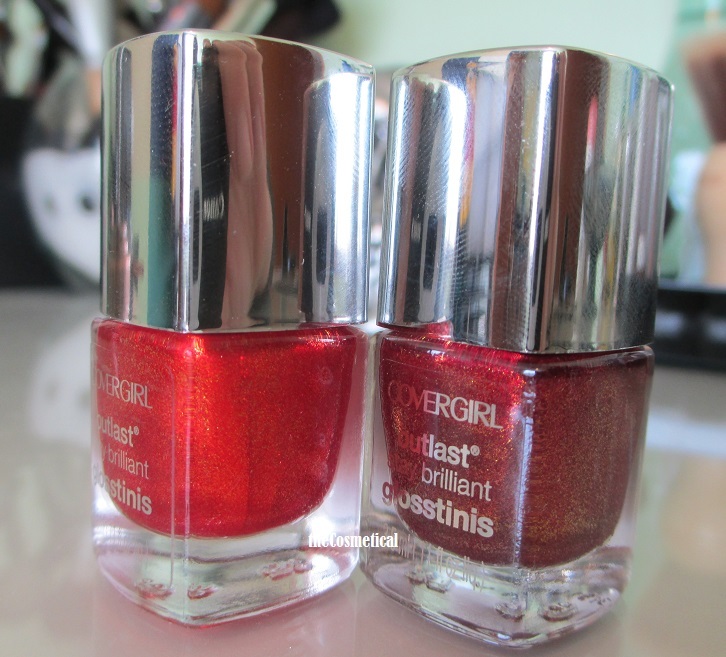 I FINALLY found the rest of the Catching Fire Glosstinis I was missing, and I have 2 of those for you today. I still have 2 more to swatch, but you can see swatches from the rest of the collection here and here. As I’ve said before, I absolutely love these polishes. Everything about this collection is perfect! First up is Violet Flicker, this is the polish I was most excited for, and it does not disappoint. Violet Flicker is a reddish purple base with purple and teal shimmer. The teal shimmer really comes out in the light, lending a teal sheen to the polish. This is 3 thin coats, and the formula was excellent. I used a coat of Out the Door for added shine. It was very hard to photograph, and I was unable to capture the teal sheen. The pictures really don’t do this one justice, it is beautiful in person. Next, Sulfer Blaze. 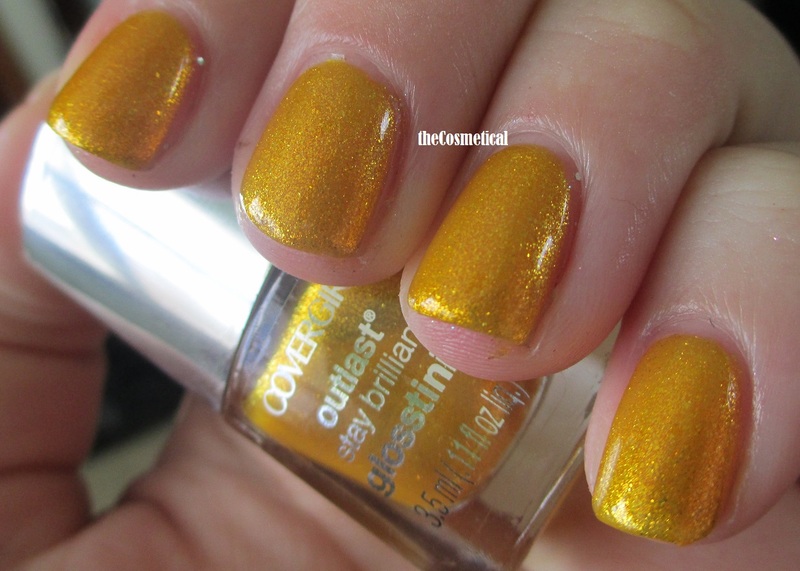 This is a bright yellow-gold, with gold shimmer throughout. Another excellent formula, and this one covered in 2 coats. Yes, it’s really that bright! I still have 2 more of these to swatch for you, so keep an eye out for those! Have you picked any of these up yet? 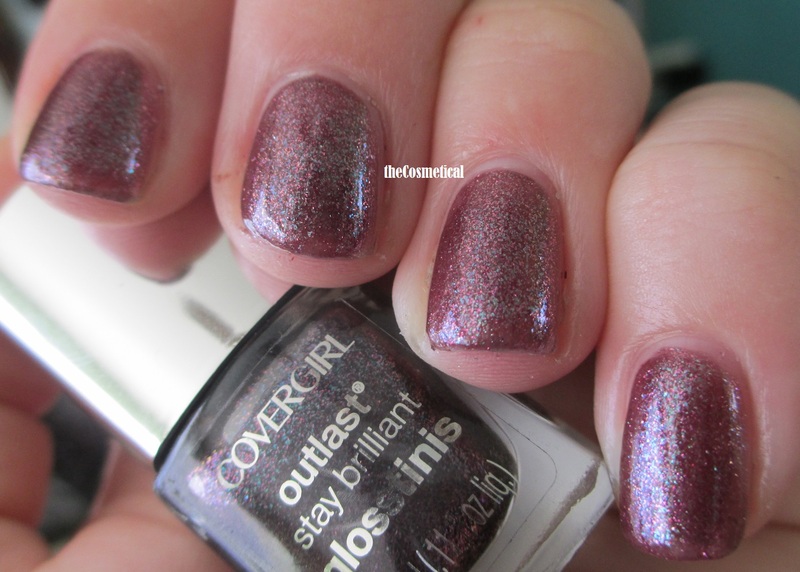 This entry was posted in Cover Girl and tagged Capitol Collection, Cover Girl, Hunger Games, Sulfer Blaze, Violet Flicker on November 20, 2013 by thecosmetical. 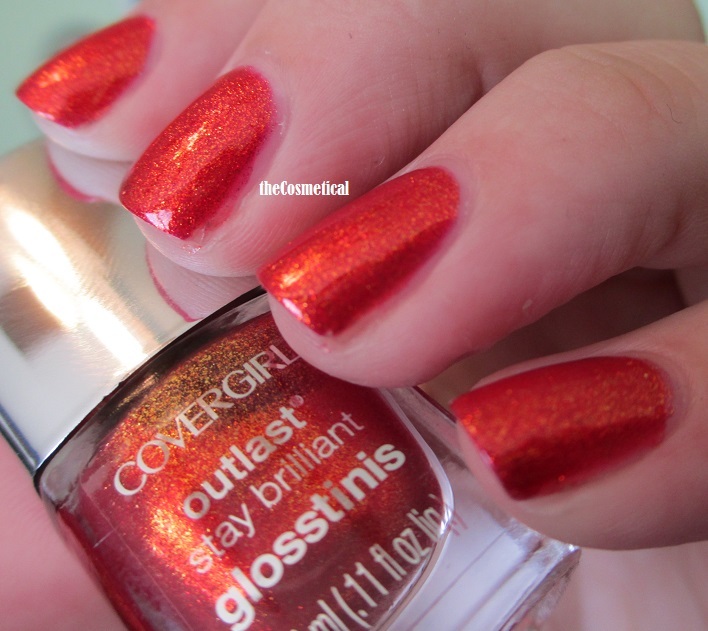 I finally found 2 more of the Hunger Games Glosstinis at Walgreens, and I have swatches for you today. First up is Scalding Emerald, an olive green base with gold and green flakes and a metallic finish. While this is an awesome color, it was a bit of a disappointment. In the bottle, it looks a bit darker than what actually shows up on the nail. I think I would like it better layered over a dark base, but it stands alone very well. Shown is 3 coats. 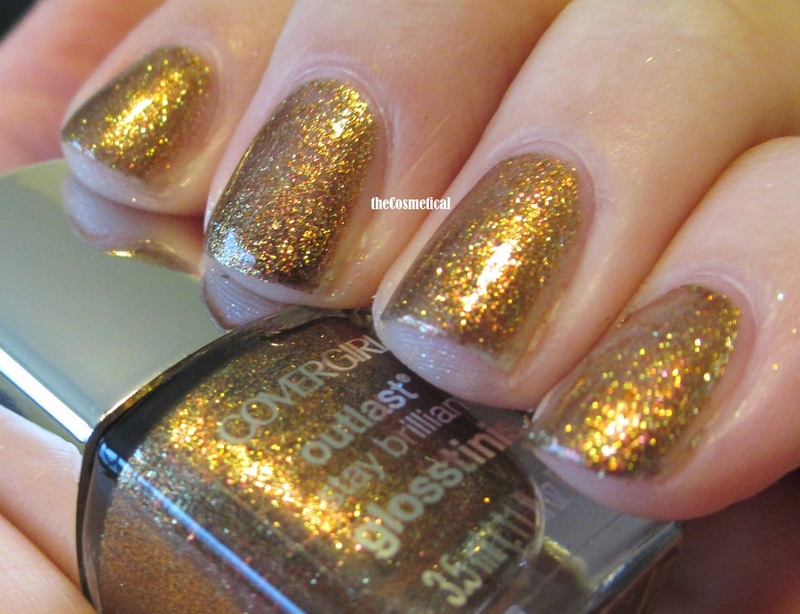 Seared Bronze is a bronze base with gold and bronze shimmer, and maybe a little holo thrown in. It shifts from dark bronze to bronze to gold. This was definitely my favorite of the two. I did 3 coats here, but probably could have gotten away with 2. Here you can really see the gold shift. I am still completely in love with this collection. 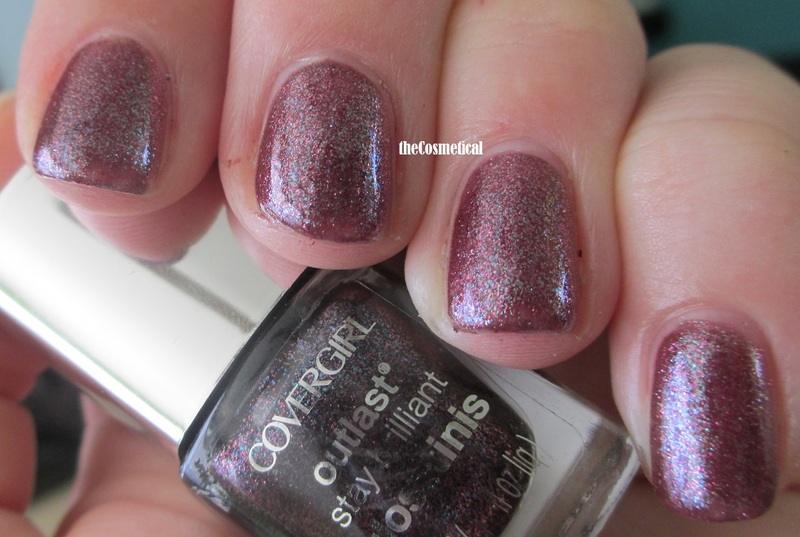 These are unlike anything I have already, and they are such beautiful polishes. Now if only I can get my hands on the purple one! 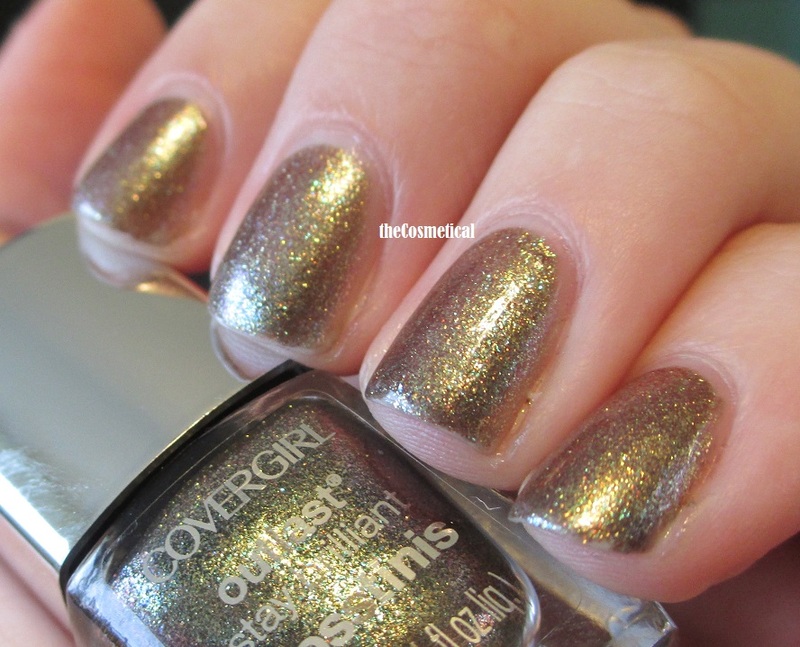 This entry was posted in Cover Girl and tagged Capitol Collection, Cover Girl, Glosstinis, Hunger Games, Scalding Emerald, Seared Bronze on November 6, 2013 by thecosmetical. 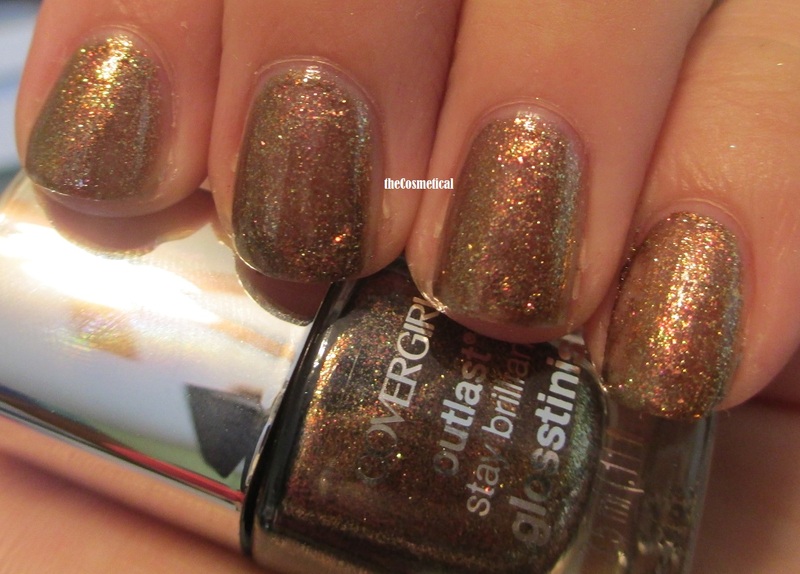 Today I have a couple of new colors from Cover Girl’s The Hunger Games: Catching Fire Capitol Collection. I was only able to get a hold of two of the polishes, but they definitely fit well with the Hunger Games theme. The first color is Inferno. 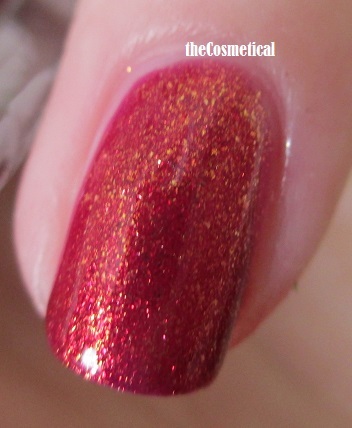 This is a dark red base with copper and gold metallic flecks. 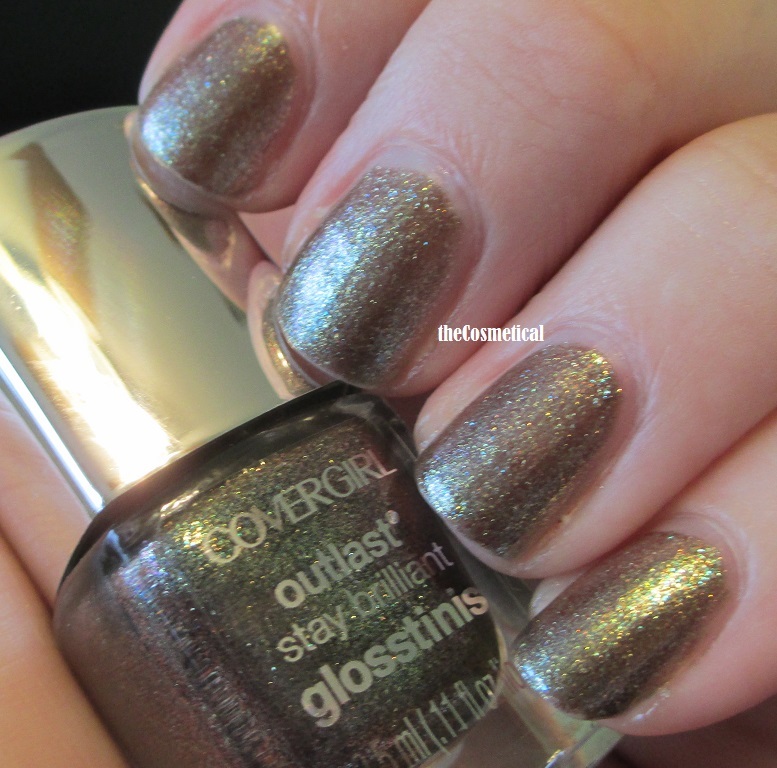 The flecks give this polish a chrome-like finish. This is two coats. Next is Rouge Red. 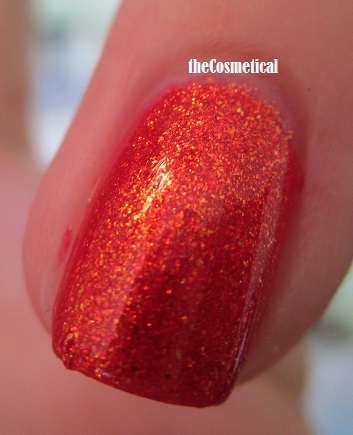 This is a lighter red base, with orange and red metallic flecks. Rouge Red needed 3 coats for full coverage. Both polishes had a great consistency. These are mini 3.5 mL bottles and I found them for $2.99. Whether you’re a fan of the Hunger Games or not, this collection is worth it. 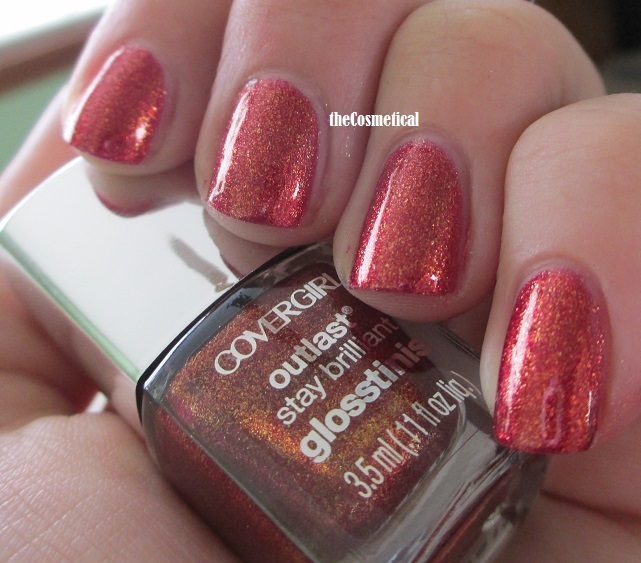 This entry was posted in Cover Girl and tagged Capitol Collection, Cover Girl, Hunger Games, Inferno, Rouge Red on October 28, 2013 by thecosmetical.